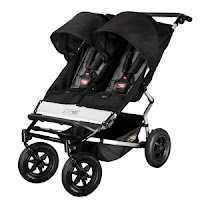 Are you looking for a Mountain Buggy Duet stroller for your twins or babies? I saw many strollers like this mountain buggy duet anywhere like in the mall, park, and boardwalks. The other when we went to the mall i saw two like this and i like the way they build this strollers it seems kids are pretty safe and comfy. The babies or kids like also this one specially they can seat side by side. The price of this mountain buggy duet stroller is pretty reasonable so you will not hard in your wallet. So if you are interested just visit the site above. Enjoy your new stroller.